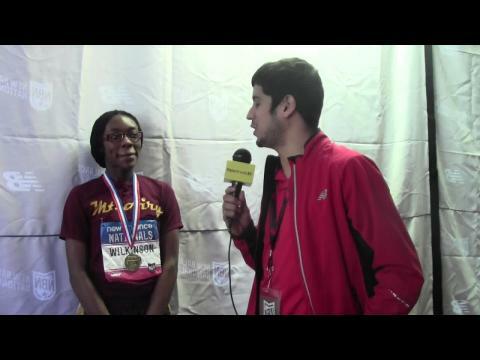 MileSplit US will be on-site with a strong coverage team providing a great depth and quality of photos, video interviews, stories, meet updates on the national page as well as via twitter (follow us @milesplit) over the three-day 2014 edition of the New Balance Nationals Indoor at the Armory in New York City. 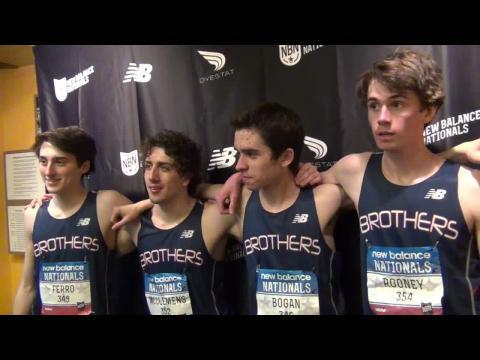 Quick highlights, winner's photo shots, event results, and video interviews from Friday's events at the 2014 New Balance Indoor Nationals. Somewhere in math class, two negatives make a positive. Sunday afternoon, Grant Fisher only needed one huge negative to make a positive, that being a New Balance Nationals Indoor championship in the boys’ mile run. Thomas Slattery and the rest of his teammates knew what was at stake. 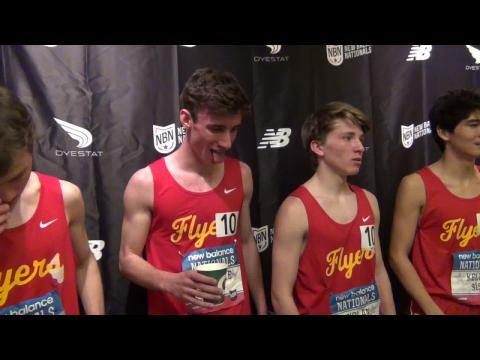 If the talented foursome from Chaminade, N.Y., wanted to pull out a win in the 4x800-meter relay at the New Balance Nationals they couldn’t back down from top-seeded Blacksburg. It was time to roll out the heavy artillery. Devin King knew it, and so did his coach. Facing a third and possibly final try at a national record, the Kentwood, La., pole vaulter reached for a longer pole to give him the edge in his battle with the crossbar. 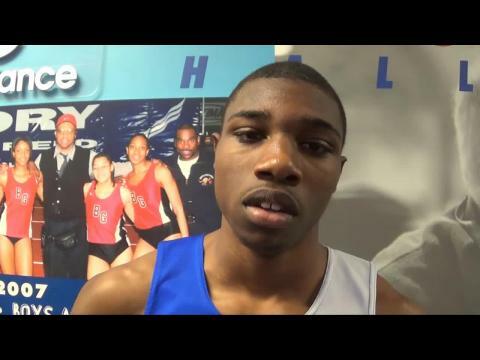 This past week MileStat was onsite to cover one of Western Branch's practices as they prepare for the start of serious in-state competition and the Penn Relays. 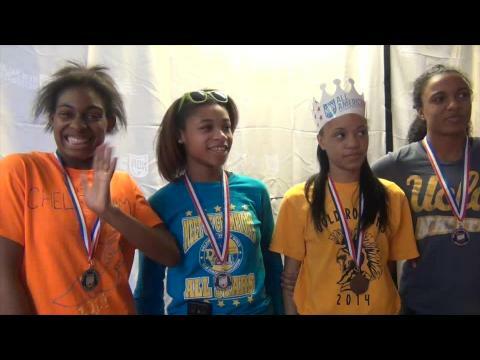 A six-part series on the 2014 Central Bucks South girls 4x800 meter relay that made Pennsylvania history on Saturday, May 24th when they claimed the all-time Pennsylvania best clocking in the event in 8:51.49. NEW YORK -- Burke's Raven Saunders set a new shot put national record of Raven Saunders 56 feet, 7.5 inches at New Balance Nationals today. MileSplit and our MileSplit affiliate state sites have covered a lot of meets over the past year, but what meets were the most popular and visited for the results, coverage, articles, photos, videos, and interviews? Take a look as we list the top 100 most visited meet pages in the country on MileSplit over the past 12 months. 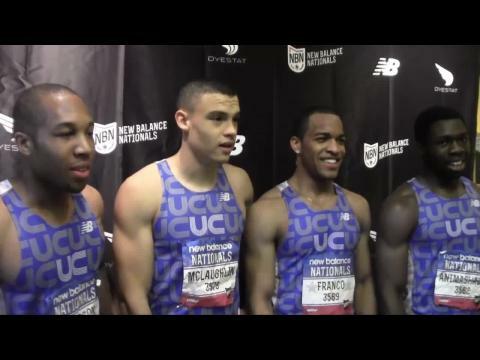 Preview of the boys events for the 2014 New Balance Indoor Nationals by Steve Mazzone. Burke alumna Raven Saunders, indoor and outdoor national record holder, is competing Saturday in the shot put at the USATF Junior Championships at Hayward Field in Eugene. Congrats to Jula Heymach and Evelyn Chavez going 1-2 in the Emergine Elite Division of New Balance Indoor Nationals. Update Performance list for New Balance Indoor Nationals. New champions will be plentiful in the girls’ events at the New Balance Indoor Nationals as only three individual champions return from 2013. And one of those former winners will move down in distance to contest a different event on the 200-meter oval. Place your vote on which of the remarkable seven total national record breaking performances from the 2014 New Balance Nationals Indoor this past weekend at the Armory in New York City was the most impressive to you below! Voting closes at 7 PM on Friday, March 21st! A quick look at the freshmen events for the 2014 indoor nationals as well as links to full freshmen national indoor rankings in the MileSplit database as of February 13th. 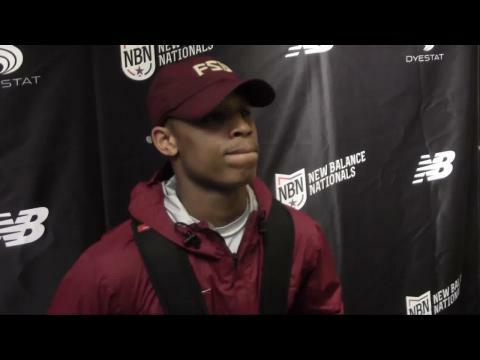 A roll call of the top 25 nationally ranked entrants found in the championship boys and girls triple jump fields for the 2014 New Balance Indoor Nationals. The office of the Penn Relays released and posted the accepted entries in the 4x800's and Distance Medley Relays this evening. These include some of the fastest teams and individuals in the state that are also favored in these relays. Any NASCAR fan will tell you that North Carolina is the center for speed in their favorite sport. 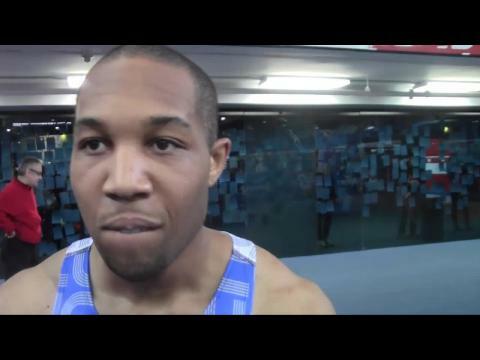 Trentavis Friday is lobbying hard that the Tar Heel state also deserves recognition for the speed of its track sprinters. 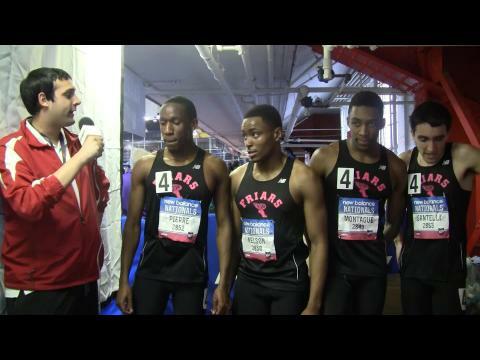 Interview with the Cardinal O'Hara (PA) boys who won the boys DMR in a US #2 all-time performance of 10 minutes flat. 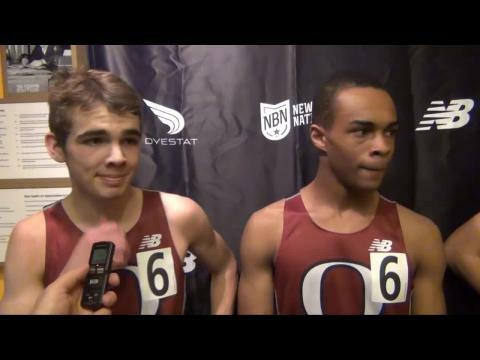 A roll call of the top 25 nationally ranked entrants found in the championship boys 60 meter dash field for the 2014 New Balance Indoor Nationals. Each year when the calendar hits April it is time to check the Milesplit rankings nearly everyday and see who is the comeptiton this year, who will win which races, and sometimes the most prudent question who will fight with the Jamaicans the longest. 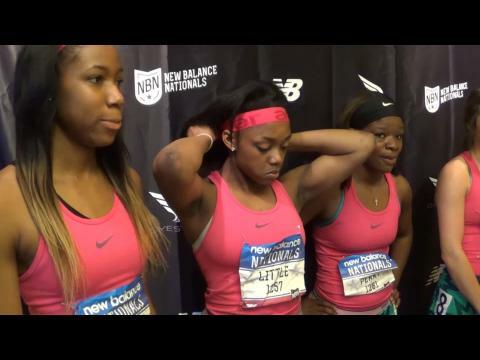 The Hoover (AL) girls set a new national record in the 4x55 meter shuttle hurdles with a 31.35 clocking. As much as anyone could feel at home in a metal cage with artificial turf, Benjamin Bonhurst might be that someone. And his “home” away from home is the throwing area at The Armory. 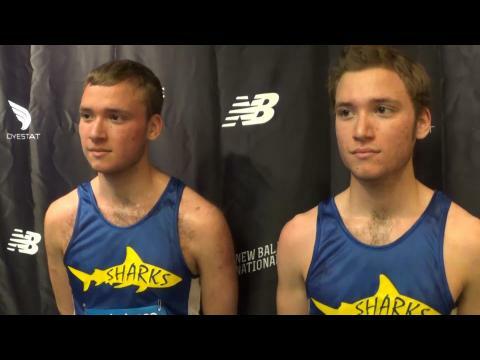 Meet stories by Phil Grove and Steve Mazzone from Saturday's events at the 2014 New Balance Nationals Indoor. 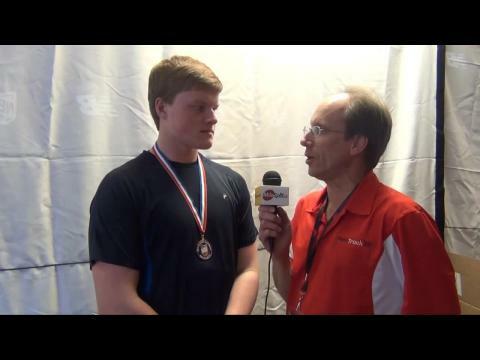 A roll call of the top 25 nationally ranked entrants found in the championship boys and girls shot put fields for the 2014 New Balance Indoor Nationals. 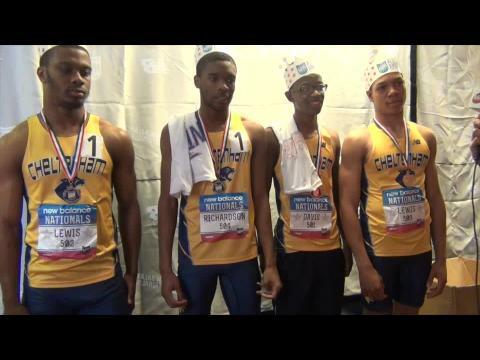 They won four of the biggest invitationals in New York City. Why would be any different at the same venue in the most important meet of them all? 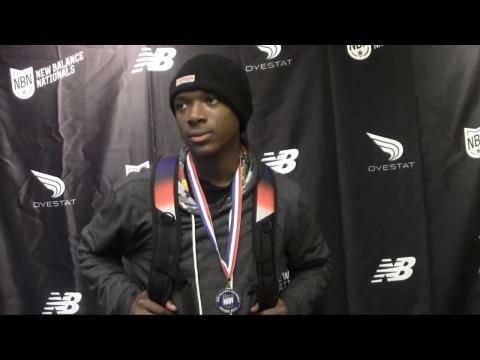 Leading up to the New Balance Nationals this weekend at the Armory in New York City, MileSplit RI will feature a top R.I. athlete (relay) that will be making the trip to the Big Apple to compete against the nation’s best. . It is really quite a feat to win all three races of the Triple Crown, and yes people I am talking about the real Triple Crown in horse racing. With California Chrome going for it, the first since 1979, it got my thinking and curious. What in our sport is of comparable difficulty as going for the Triple Crown. The indoor track & field season has been moderately frustrating for Connor Mantz. Even though the Skyview (UT) junior has run a few quality times since the start of the year, the victories have been minimal. 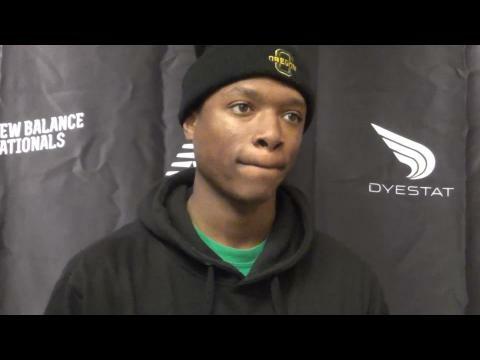 But it all came together Friday night at the New Balance National Indoor Championships. A national record for the 60-meter hurdles has been on Dior Hall’s “Bucket List” this season. 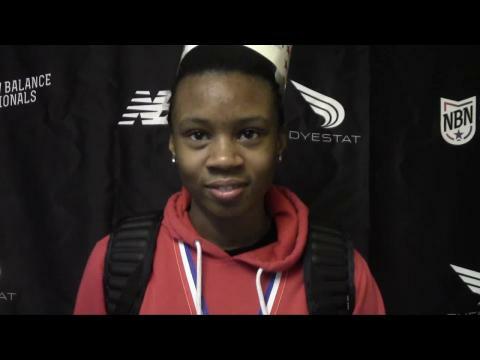 Prior to the New Balance Nationals, she’s come close on several different occasion. On Sunday, she finally got it done. A roll call of the top 25 nationally ranked entrants found in the championship boys and girls weight throw fields for the 2014 New Balance Indoor Nationals. 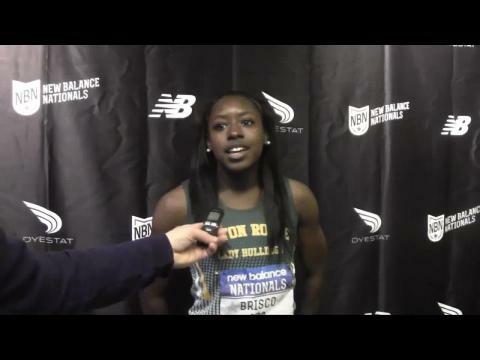 Quick highlights, winner's photo shots, event results, stories, and video interviews from Sunday's events at the 2014 New Balance Indoor Nationals. 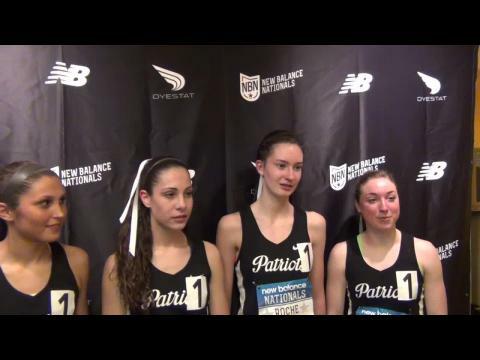 Tessa Barrett set the national high school record in the girls 5K with a 16:11 performance at the 2014 New Balance Nationals. Raven Saunders wasted no time in etching her name into the record books. 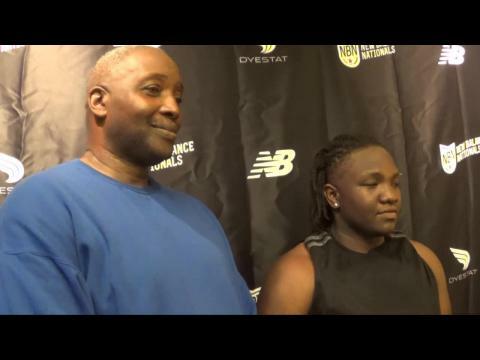 The senior from Burke High in South Carolina smashed the national mark in the shot put at the New Balance Nationals on Saturday with a heave of 56 feet, 7.5 inches. 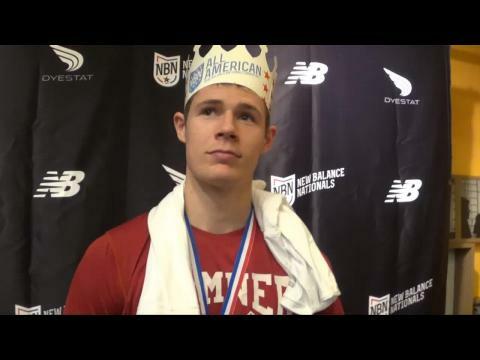 Quick highlights, winner's photo shots, event results, stories, and video interviews from Saturday's events at the 2014 New Balance Indoor Nationals. 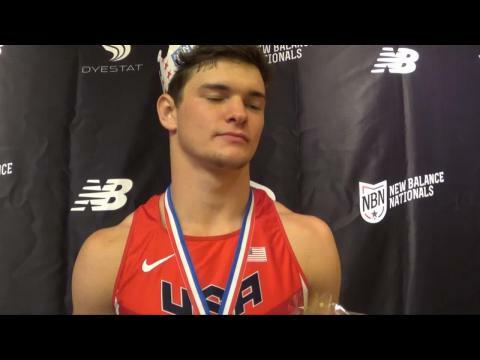 A roll call of the top 25 nationally ranked entrants found in each of the championship events for the 2014 New Balance Indoor Nationals to be posted throughout the week leading into the meet. It was hardly beginner’s luck, but the Hoover, Ala., shuttle hurdle squad showed it didn’t need a lot of races together to get into sync and strike for gold medals. 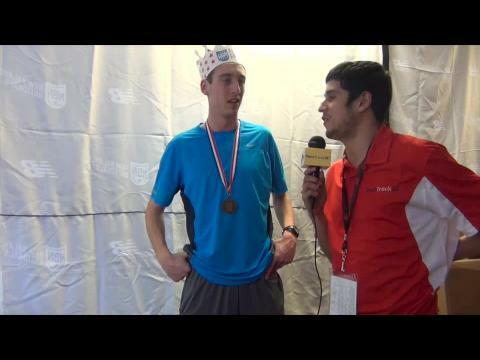 Connor Mantz of Sky View (UT) won the New Balance Nationals indoor 5K title with a time of 14:24. US #6 all-time. 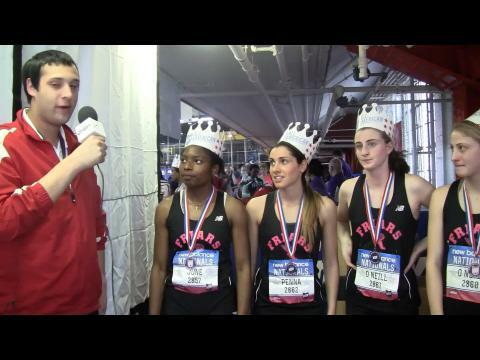 A roll call of the top 25 nationally ranked entrants found in the championship boys and girls 4x200 meter relay fields for the 2014 New Balance Indoor Nationals. With the top three schools from the Nike Cross-Country Nationals on the line – team champion Gig Harbor (WA), runner-up Christian Brothers Academy (NJ) and Brentwood (TN) – the boys’ 4x1 mile relay had all the makings of an epic showdown at the New Balance Nationals Saturday afternoon. 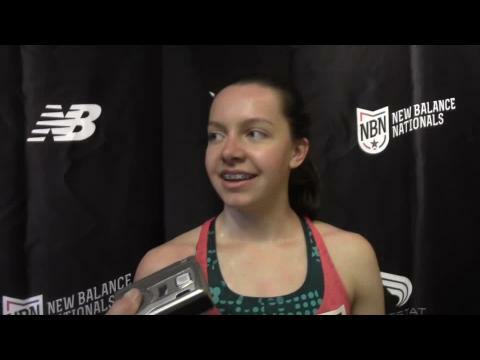 No one really knew about Elise Cranny at last year’s New Balance Nationals. But the gifted senior from Colorado quickly made a name for herself by surprising the competition with a meet record of 4:40.62 in the mile run. A list of the US high school boys national leaders as of March 17th in the most commonly contested events during the 2013-2014 indoor track & field season based on performances currently entered in MileSplit database. Abington Heights senior Tessa Barrett qualified for states in XC as a freshman and sophomore, and after an eye-opening 17:58 at the 2012 Tennett Invitatonal, she looked destined to challange for a state AAA title. But a mud-fest at the District 2 meet led to an injury, and the opportunity was lost. She bounced back in indoor with a solo 10:02 3k in February 2013. Her 3000 at PTFCA champs was an epic battle with Courtney Smith and Regan Rome - one she ultimately won in a state record 9:47.73. 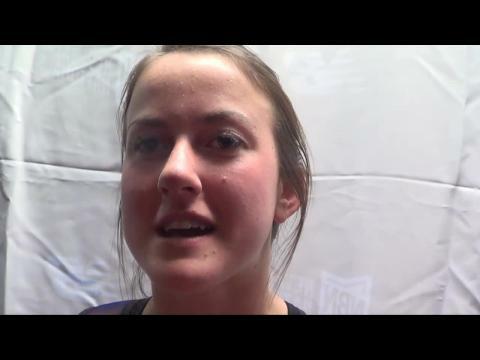 She would go on to take 4th at the Penn Relays 3000 in 9:40, and then 2nd (to Smith) in another battle at outdoor states, going 10:25 for 3200 meters. This year she opened with a stunning 17:26 at Cliff Robbins, and then not only won the Gold Race at PIAA Foundation, but set the course record for the Poop-Out Hill layout in 17:48. 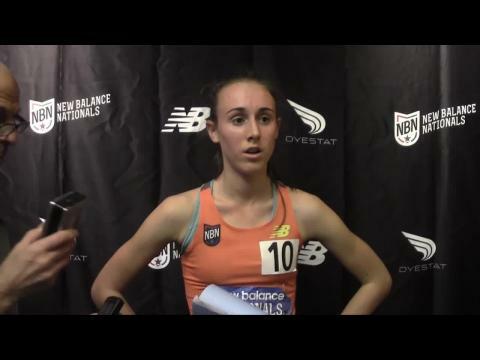 And then she followed in the recent spike-prints of Neely Spence and Angel Piccirillo, winning the Foot Locker Northeast Regional... then trumping all of the past Foot Locker finalists from PA by winning the championship at storied Balboa Park. But she was only beginning an incredible final high school campaign - resetting her state 3K record four more times - first at the Susquehanna High School Classic in late January; then again at the PTFCA State Championships on March 1, and then twice more at New Balance Indoor Nationals - both en route, first in the 5000 meter championship in which she set a national record of 16:11.85, and then two days later in (9:31.09) winning the two-mile title in a PA record and US#1 10:08.05. And we still have outdoor! WHEW! 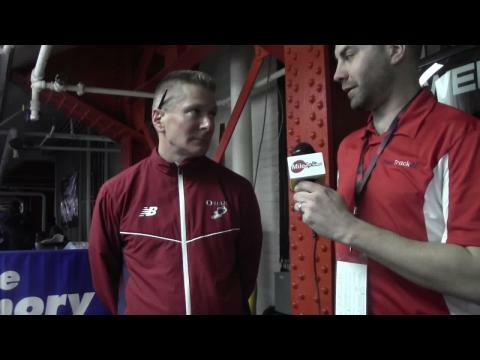 Cardinal O’Hara coach Tom Kennedy was confident his distance medley relay could run fast and clock a time close to 10-minutes flat at the New Balance Nationals. He also felt that to do that it would take a near-perfect effort by everyone that carried the baton. A roll call of the top 25 nationally ranked entrants found in the championship boys and girls pole vault fields for the 2014 New Balance Indoor Nationals. His victory in Saturday’s long jump competition left Nathaniel Moore looking forward to bigger and better things in the 2014 outdoor season. Another gold medal on Sunday has the Fremont, Calif., standout more anxious than ever to compete outdoors. Your one stop location for coverage, specifically of Virginians, of all things New Balance Indoor Nationals. 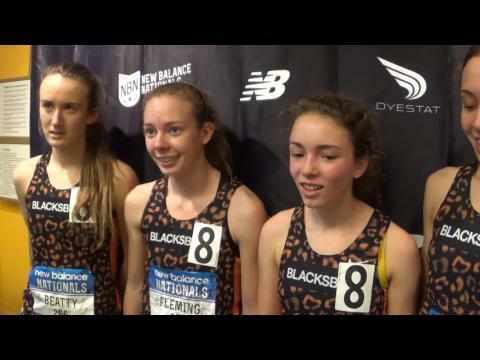 Based on their 1-2-4-5 finish at the state meet a few weeks ago where they averaged a 5:01 mile, Blacksburg (VA) was considered a strong favorite to win the 4x1 mile relay at the nationals. But that all changed a week and a half ago when a foot injury to relay member Emily Beatty forced the junior to resort to an elliptical machine this past week leading up to the big meet. While the vast majority of Florida athletes were competing across the state, several headed to the famed Armory in New York, the site of New Balance Nationals Indoor. 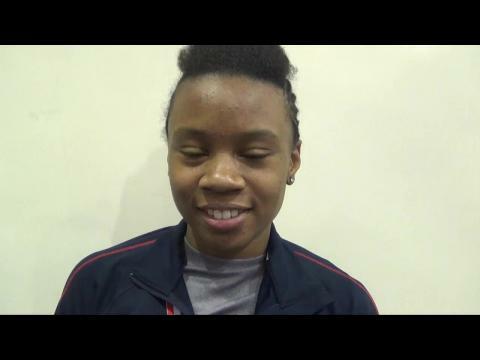 Freeport senior and University of Arkansas claimed the national title in the pentathlon while North Florida Christian senior and University of Florida signee Darrielle McQueen leaped to a new personal best 41-3.75 in the triple jump and a runner-up finish. 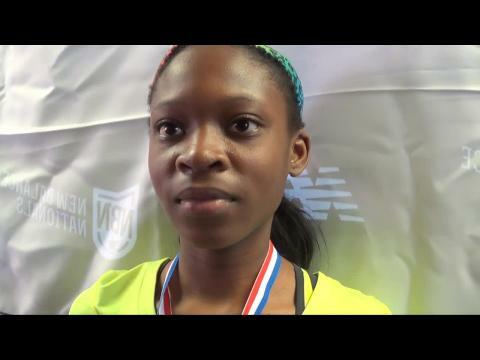 Class of 2017 star Karimah Davis was second in the girl's freshman 400 meter dash. 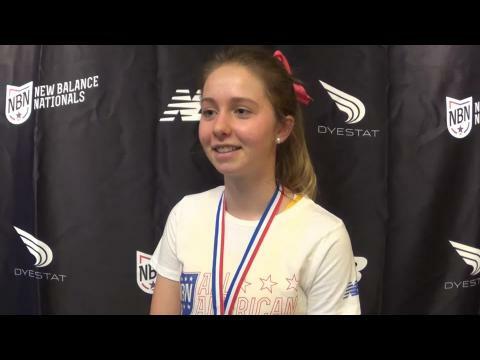 VA Highlights from New Balance Indoor Nationals, two more national champions and three Virginia State Records. 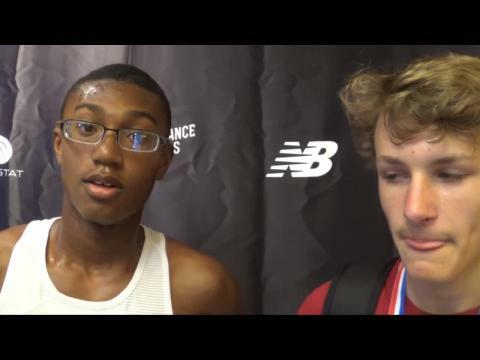 A roll call of the top 25 nationally ranked entrants found in the championship boys and girls high jump fields for the 2014 New Balance Indoor Nationals. Christian Brothers Academy (NJ) smashed the old record of 17:20.20 from 2012 with an epic performance in which 3rd and 4th place also went under the old record! John Blackburn discusses his recent naming as an International Technical Official for the fourth time by the IAAF. Blackburn is currently in New York at New Balance Nationals. Judging from the numbers registered during Saturday’s long jump finals, the runway at The Armory served as a pretty decent launch pad. 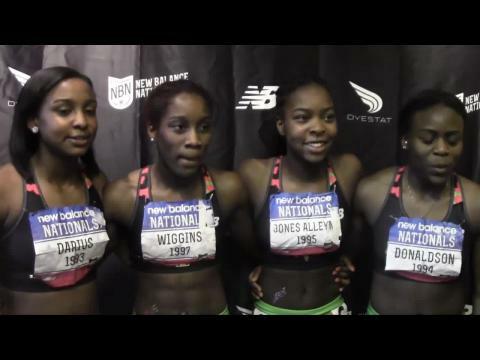 Photo coverage by MileSplit photographers from the 2014 New Balance Nationals Indoor. Thousands of photos have been posted with even more yet to be added! Unionville senior Courtney Smith enters her third year of XC with a resume that has been growing season-to-season. As a sophomore, she was 4th in AAA at Hershey. Then last year, she won her first state title, setting a meet and course record. 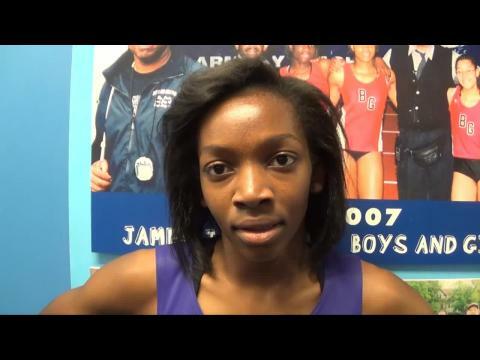 In the winter, she broke the state record in the 3000 meter run, but had to settle for 2nd place. 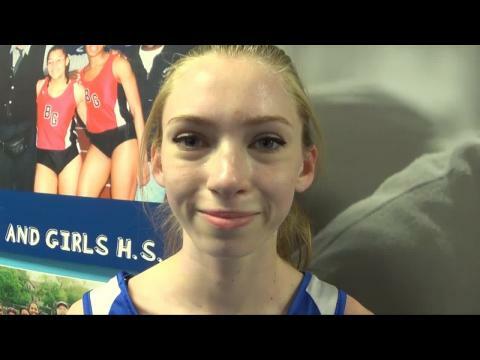 She more than made up for it by twice outsprinting the same competitor, first for 3rd place in the Girls 3000 Invitational at the Penn Relays, and then in the finals of the AAA 3200 meter run at the PIAA State Championships. Despite an injury, Smith captured 3rd in an incredible 3000 at PTFCA Indoor States, and anchored her DMR to a state title. 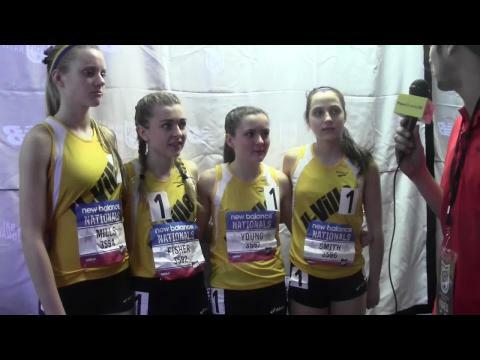 Then two weeks later, she anchored that DMR to a 6th place finish in the New Balance Nationals Indoor champs in a time ten seconds better than their state title... and anchored the 4xmile the next day to a 3rd place finish - both earning all-American recognition. Ellen Dipietro brought a little March madness Friday to one of the most storied venues in track and field. 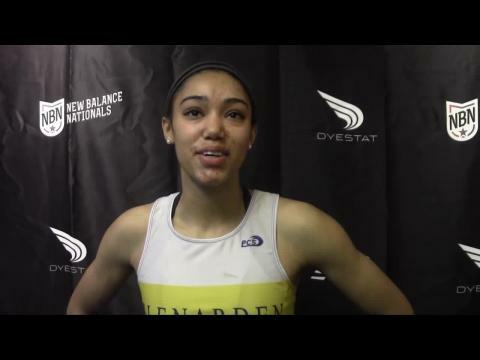 Already the national leader in the girls’ high jump, Dipietro captured the New Balance indoor title by making like a power forward looking for a rebound, adding to her 2014 US best with a winning clearance of 5 feet, 10.5 inches. 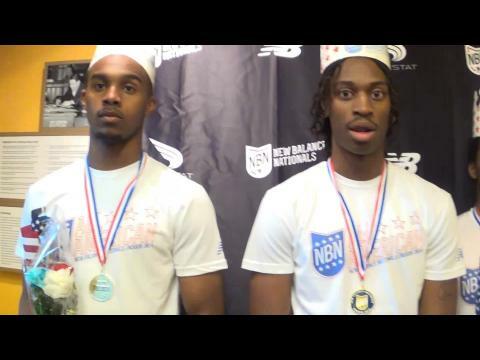 A roll call of the top 25 nationally ranked entrants found in the championship boys and girls 200 meter dash field for the 2014 New Balance Indoor Nationals. 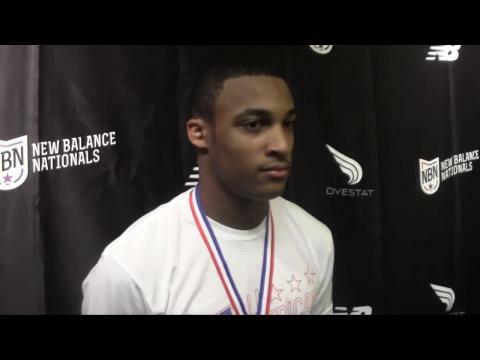 A roll call of the top 25 nationally ranked entrants found in the championship boys and girls 60 meter hurdles fields for the 2014 New Balance Indoor Nationals. 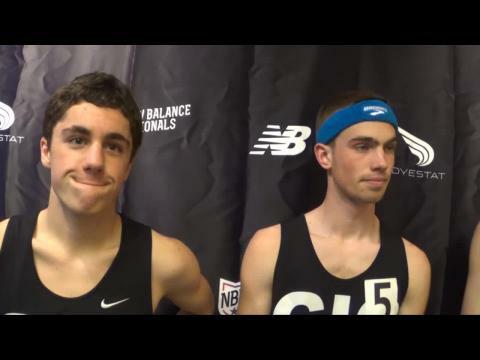 A roll call of the top 25 nationally ranked entrants found in the championship boys and girls two mile run fields for the 2014 New Balance Indoor Nationals. 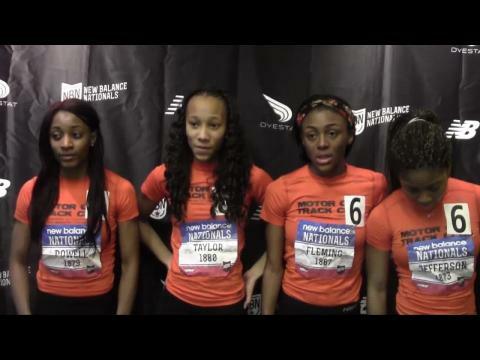 Sunday was the time to tidy up any loose ends or unfinished business from the 2014 indoor season, and one of the nation’s best relay teams definitely had some missions to accomplish on the final day of the New Balance Nationals Indoor. They never knew what hit them. 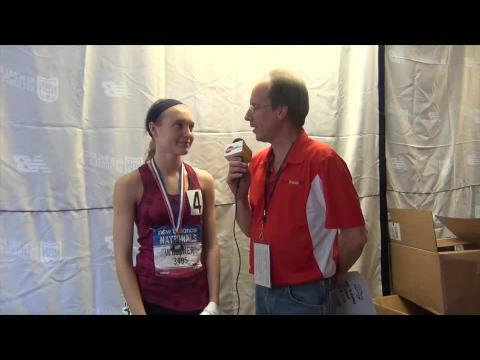 Pennsylvania’s Tessa Barrett led every step of the way in dominating the girls’ 5,000-meter run, claiming an indoor national title and an all-time record Friday at The Armory. Tessa Barrett is thinking about taking a little break from all the hard training and racing she has been doing lately. Maybe some light runs around the block with her dog, nothing crazy. A little rest before the outdoor-season begins. 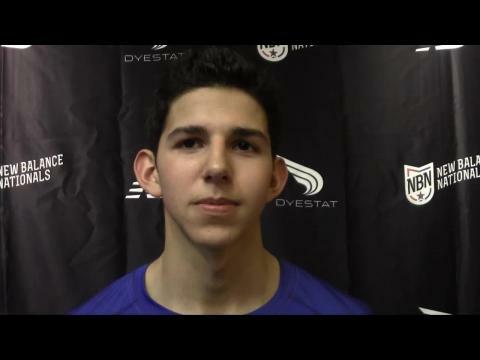 Not much got in the way of Canadian Paul Galas and a New Balance National title in the high jump. Well, nothing outside of a cleaning lady ready to tidy up The Armory as Saturday’s final event came to a close. 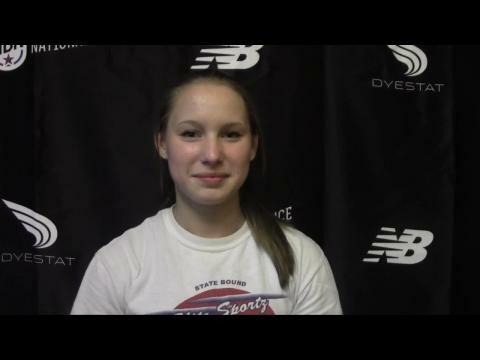 A roll call of the top 25 nationally ranked entrants found in the championship boys and girls long jump fields for the 2014 New Balance Indoor Nationals. The footsteps were there, and West Springfield anchor Caroline Alcorta knew they weren’t going away. In fact, they were getting closer. Despite the efforts of some heavy-hitting 1,600-meter anchors, Alcorta and her Virginia teammates held the lead and ruled the day in the girls’ distance medley relay. One could excuse Adam Kelly for being a little nervous and in a hurry. After all, national championships were on the line Sunday in New York City. 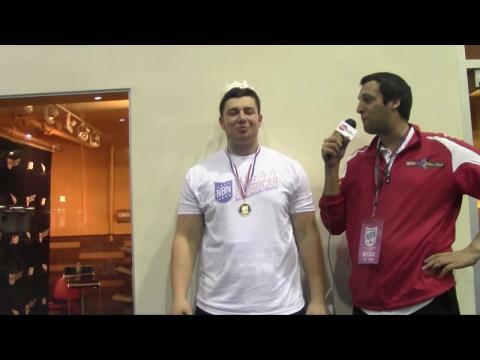 Despite some anxious moments, the junior from Barrington, R.I., was able to withstand a late challenge and capture the New Balance Nationals Indoor title in the weight throw. 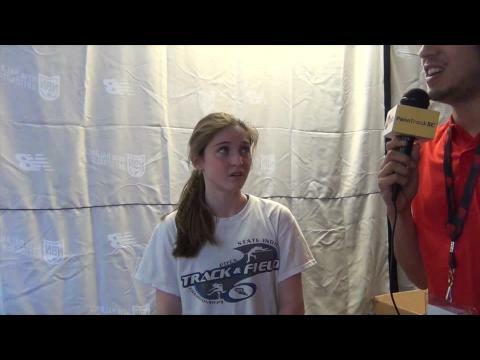 Highlights of VA athletes from the 2014 New Balance Nationals, including interviews, photos, results and splits where possible. 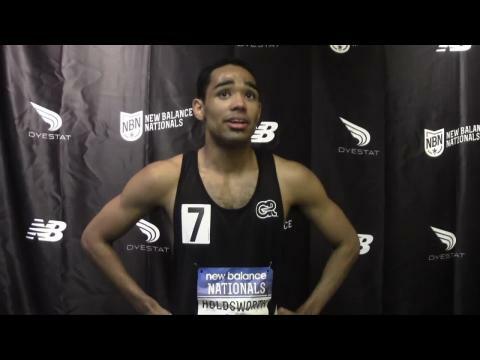 A roll call of the top 25 nationally ranked entrants found in the championship boys and girls 800 meter run fields for the 2014 New Balance Indoor Nationals. 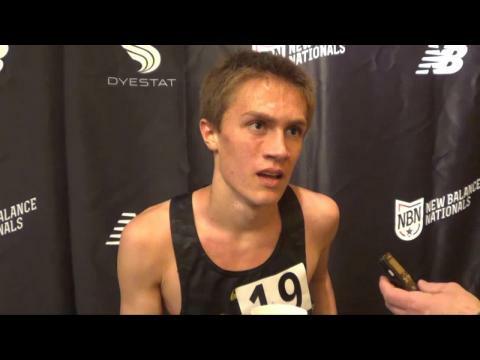 A roll call of the top 25 nationally ranked entrants found in the championship boys and girls mile run fields for the 2014 New Balance Indoor Nationals. A national title in the 800-meter run wasn’t the only thing on the line Sunday afternoon at The Armory when 10 middle distance standouts awaited the starter’s gun. As it played out, bragging rights for the state of Virginia also were very much at stake. 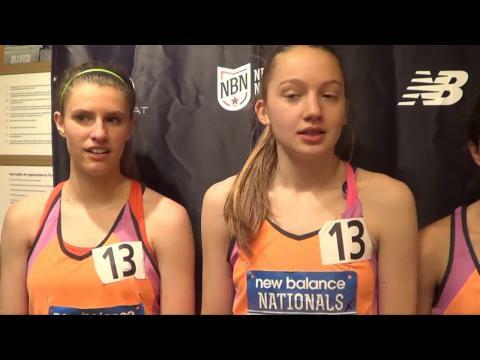 A roll call of the top 25 nationally ranked entrants found in the championship boys and girls 4x800 meter relay fields for the 2014 New Balance Indoor Nationals. Preview of the VA boys competing in Friday-Sunday's competition at the Armory in New York as part of New Balance Indoor Nationals. Complete recap from New Balance Indoor Nationals for all Virginia competitors and teams including all the all-american finshers. Anthony & Alex Peters (IL) went 1-2 in the boys race walk. 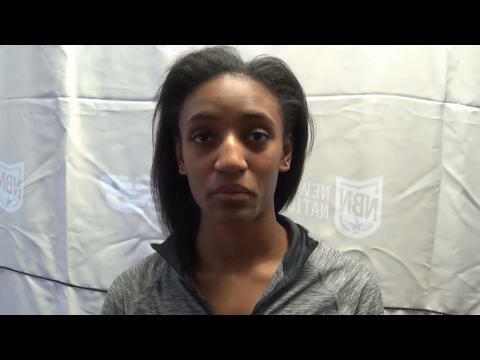 Interview with Dior Hall (CO) after clocking a time of 8.27 in the 60 hurdles prelims. Leading up to the New Balance Nationals this weekend at the Armory in New York City, MileSplit RI will feature a top R.I. athlete (relay) that will be making the trip to the Big Apple to compete against the nation’s best. Leading up to the New Balance Nationals this weekend at the Armory in New York City, MileSplit RI will feature a top R.I. athlete (or relay) that will be making the trip to the Big Apple to compete against the nation’s best. 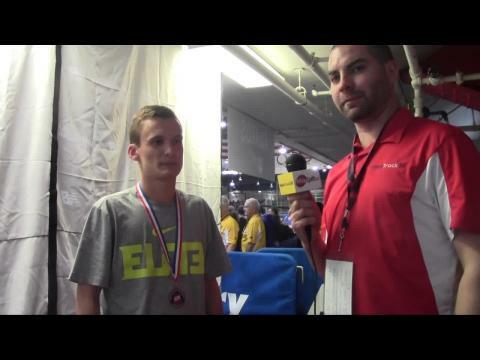 Sean Kelly unleashed a monster kick to bring home the Armory record and national title for the Chaminade boys. 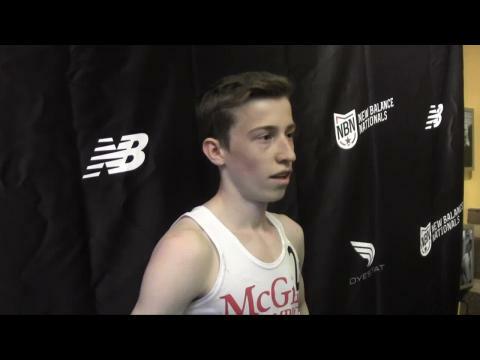 A roll call of the top 25 nationally ranked entrants found in the championship boys and girls 5000 meter run fields for the 2014 New Balance Indoor Nationals. The month of March provided New England with some fantastic performances. Here is a list of New England Boys rankings since March 1st. After three exciting days of the best track & field this indoor season, the New Balance Nationals at The Armory came to a close on Sunday. There were seven national records, several meet marks and nation No. 1 efforts and some great performances from our Rhode Island athletes, too. 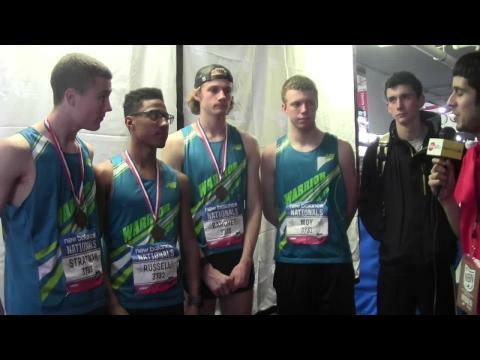 Besides winning a national championship, there was something else on the minds of the St. Anthony’s foursome before lining up for the finals of the sprint medley relay. Hannah Cunliffe (Federal Way WA) was the top qualifier from the girls 60 dash prelims in 7.39. Rhode Island athletes competing at next weekend's nationals. 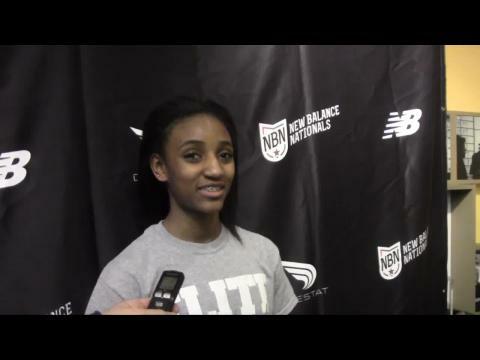 Video Coverage from New Balance Indoor Nationals including interview, races, and much more! Mikiah Brisco is one of those athletes that some may envy. The senior from Baton Rouge, La., is among the best nationally in the hurdles and the sprints, two events she competed at this past summer at the IAAF World Youth Games in Ukraine. 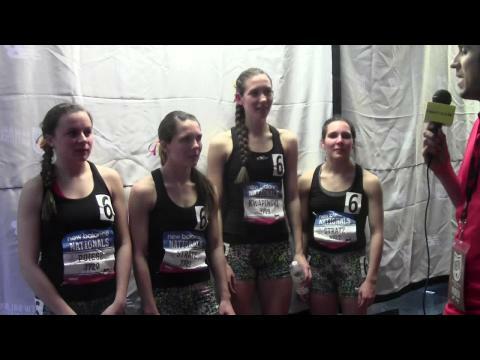 A roll call of the top 25 nationally ranked entrants found in the championship boys and girls 4x400 meter relay fields for the 2014 New Balance Indoor Nationals. With under a week until the 2014 installment of the New Balance National Indoor Nationals, it is now time to see who will not only come home with a title but who will produce the best performance. 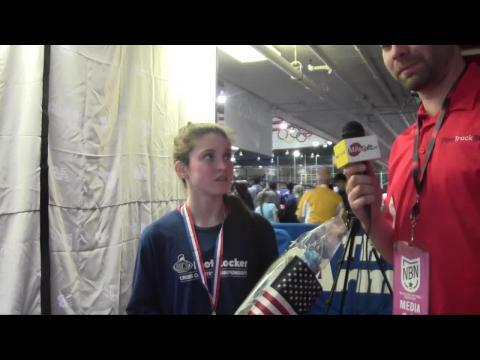 There weren’t too many athletes that got more hype before this weekend’s New Balance Nationals than Alexa Efraimson. 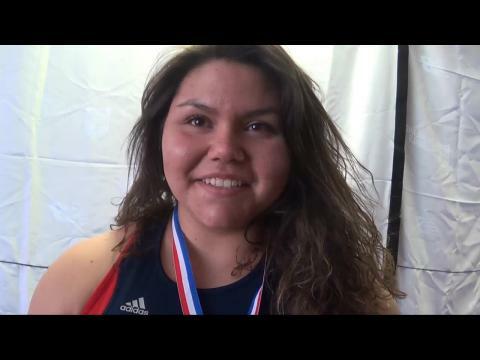 At last year’s New Balance Nationals, Ohio’s Gabby Figueroa was the top-seeded weight-thrower in the country, but left The Armory with a moderately-disappointing third-place finish. 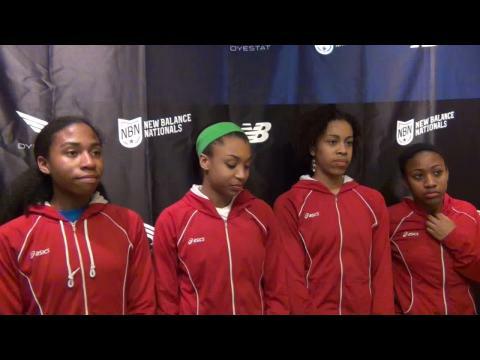 Preview of the VA girls competing in Friday-Sunday's competition at the Armory in New York as part of New Balance Indoor Nationals. Aaron Templeton (TN) was runner-up in the boys 5K with a time of 14:37. 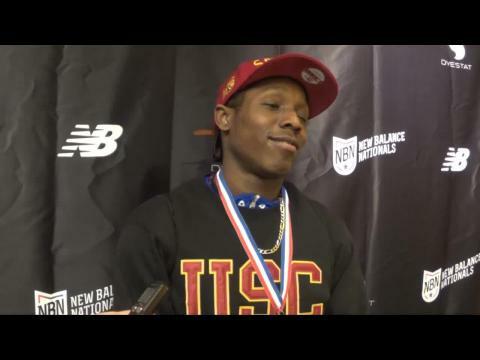 Last week, we asked MileSplit US site followers to vote on the most impressive national record breaking performance from the 2014 New Balance Nationals Indoor. Many options to choose from after 7 national records were set at this year's indoor national championship meet. After nearly 2,000 votes were tallied, we can confirm an official winner. Dior Hall shattered the US all-time 60 meter hurdles mark with a run of 8.11 in the event finals. Photo by Don Rich/Penn Track XC. Rhode Island has potential for a number of All-American finishes (and possibly a victory or two). Desiree has been breaking records all year long. She set a national record this weekend jumping an incredible 14-02.75. 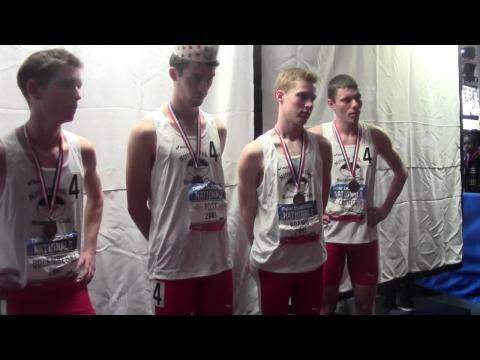 La Salle boys just miss All-American status in 4x1 mile. McIntosh breaks own 200m mark. Tierney sets mark in 5K. 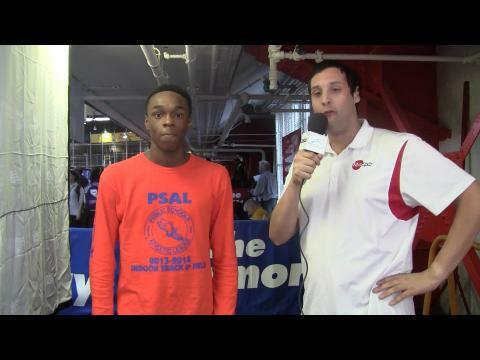 Statistical highlights from New Jersey performances at Nationals day one! 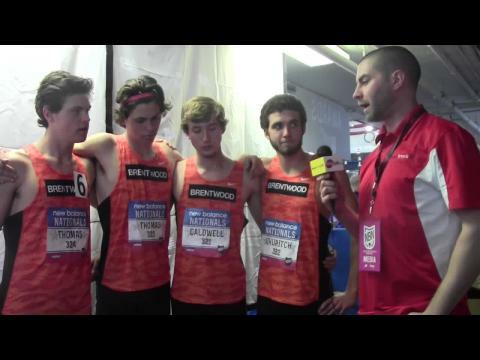 Brentwood (TN) crushed the old national record of 17:20.20 but had to settle for third in one of the most exciting races of the meet. 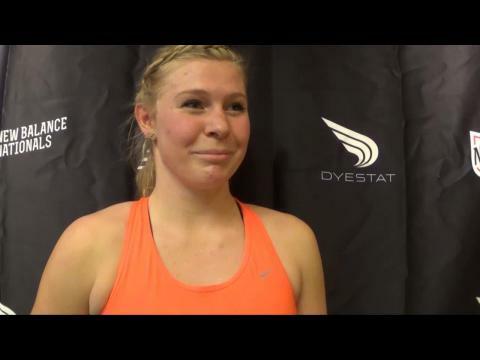 Stephanie talks about her runner-up finish in the 5k, her 4:49 in the mile and her international triathlon experience and goals. CB South set the PA All-Time state record with their 4th place finish in the 4x800. 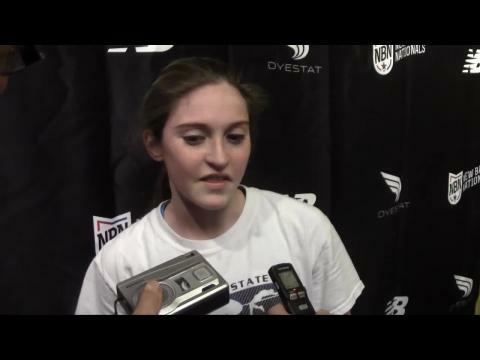 University's Amelia Paladino finished second in the mile run at the New Balance Indoor Nationals. 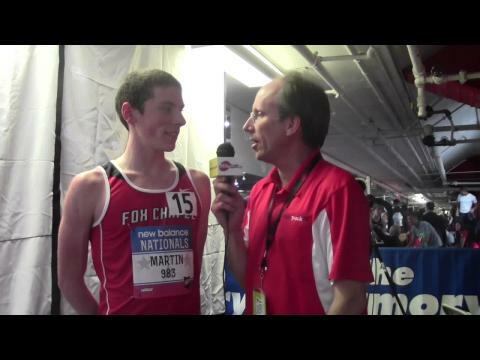 Video interviews and race videos from the 2014 New Balance Nationals Indoor on March 14th through March 16th at the Armory in New York City.